Brigitte and Alan are very pleased to welcome you in their comfortable home. The two guestrooms have en suite, television and free- Wi-Fi. You will start the day with a smile and a generous breakfast. We are situated in a quiet area, close to public transport with excellent connections to the City centre and within walking distance to shops, restaurants and the theatre “Forest National”. This is the ideal location to enjoy a peaceful place close to the tourist attractions and the lively City of Brussels. We will welcome you warmly and will share with you our love of Brussels. For 1 night stay only, 10 Euros supplement per room. 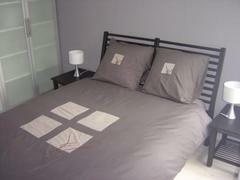 Additional bed (“recto” room only): 20 Euros per night .